A53-131; Print, 1850 Masonic Union - [NY] - A Art Paintings Etchings Engravings, Etc. [NY] - A Art Paintings Etchings Engravings, Etc. A large lithograph showing the 1850 Masonic Union of St. John's Grand Lodge and the Grand Lodge of New York. A large, multi-color lithographic print titled at the bottom of the image, beneath the border lines, "The Great Masonic Union Celebration of the Brethren hitherto Under the Jurisdiction of St. John's Grand Lodge with the Most Worshipful Grand Lodge of the M.. A.. & Hon.. Fraternity of Free & Accepted Masons of the State of New York at Tripler Hall, City of New York, Friday, December 27, AD 1850, AL 5850." The image shows a large theater with four men in the foreground of the stage and sixty arranged on stage behind them. The two men in the center of the foreground are shaking hands, with the one on the left is holding a hat at his side in his left hand. Directly in front of them is a staircase with ten steps leading down to the floor of the theater. There is a man on either side of the two central figures. These men are slightly farther away from the foreground. Behind these four men, there is a semi-circle of sixty men, with a small table on either side covered with a floor-length tablecloth. There are men seated behind each of these tables as well as to either side. All of the men on stage are wearing aprons, most of which are black with gold trim. They are also wearing long pendant collars of black with gold trim. There is a little person on either side of the stage, each of whom is also wearing an apron and collar. Toward the back of the crowd on stage, there are eight banners on poles being held up. The banners on either end are large, vertical rectangles, with indistinguishable images. The six smaller banners are small, horizontal rectangles, each with one word written on it, from left to right, as follows: "Faith," "Hope," "Charity," "Wisdom," "Strength," and "Beauty." On the floor of the stage to the left of the central four men is an Ark of the Covenant with an urn on top in the center and with an angel on either side which has its wings pointed toward the middle of the Ark. To the right of the Ark is a cornucopia. On the stage floor to the right of the four men is, from left to right, a low, red-fabric covered ottoman with an open book on top, a beehive and two globes on stands. 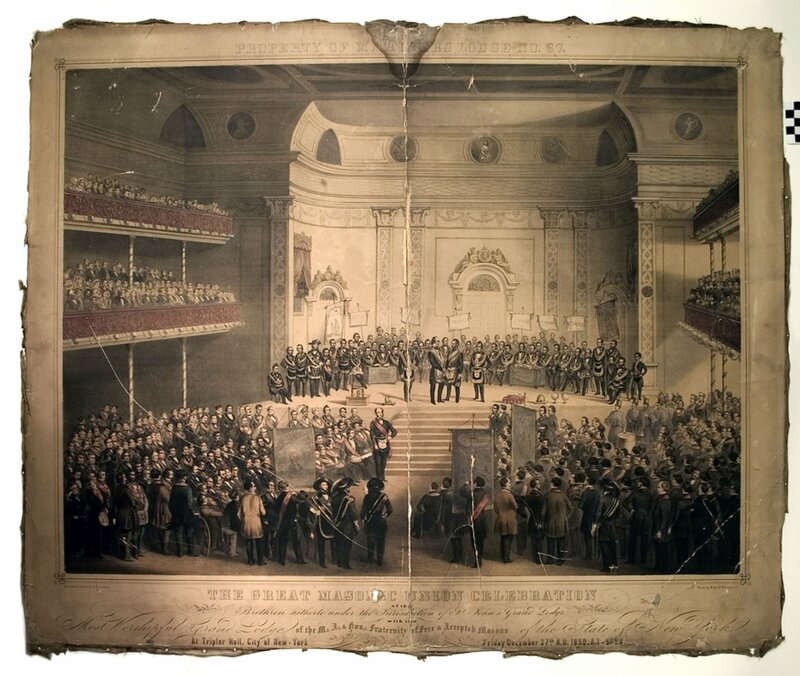 <br>Description of the lithograph:<br><br>A large, multi-color lithographic print titled at the bottom of the image, beneath the border lines, "The Great Masonic Union Celebration of the Brethren hitherto Under the Jurisdiction of St. John's Grand Lodge with the Most Worshipful Grand Lodge of the M.. A.. & Hon.. Fraternity of Free & Accepted Masons of the State of New York at Tripler Hall, City of New York, Friday, December 27, AD 1850, AL 5850." The image shows a large theater with four men in the foreground of the stage and sixty arranged on stage behind them. The two men in the center of the foreground are shaking hands, with the one on the left is holding a hat at his side in his left hand. Directly in front of them is a staircase with ten steps leading down to the floor of the theater.<br>There is a man on either side of the two central figures. These men are slightly farther away from the foreground. Behind these four men, there is a semi-circle of sixty men, with a small table on either side covered with a floor-length tablecloth. There are men seated behind each of these tables as well as to either side. All of the men on stage are wearing aprons, most of which are black with gold trim. They are also wearing long pendant collars of black with gold trim. There is a little person on either side of the stage, each of whom is also wearing an apron and collar. Toward the back of the crowd on stage, there are eight banners on poles being held up. The banners on either end are large, vertical rectangles, with indistinguishable images. The six smaller banners are small, horizontal rectangles, each with one word written on it, from left to right, as follows: "Faith," "Hope," "Charity," "Wisdom," "Strength," and "Beauty." On the floor of the stage to the left of the central four men is an Ark of the Covenant with an urn on top in the center and with an angel on either side which has its wings pointed toward the middle of the Ark. To the right of the Ark is a cornucopia. On the stage floor to the right of the four men is, from left to right, a low, red-fabric covered ottoman with an open book on top, a beehive and two globes on stands. Behind the crowd on the stage, the wall of the stage is curved in a band-shell type structure, with one arched doorway in the center, and one in the middle of each of the curved sides. The center arch is taller than the other two. On either side of the curved portion of the shell, closest to the hall, there is a seating box with draped curtains. Two people are visible in the seating box on the left side of the stage. Each of the three arches on stage is surmounted by a circle, within which is an image of a head. Depicted on either side of each of the circles is a reclining stone figure. The figures are naked, with wings. Each pair is holding the central circles with their arm closest to the circle, with their outer arms crossed in front of their bodies or resting at their sides. The central arched doorway is separated from the curved sides by two stylized columns on either side. The columns have Corinthian tops, and each has a circle shape in the center. Within each circle is a four-petal flower. On the columns, above and below the circles, there is a stylized heart-shaped pattern, with the point of each stylized heart directed away from the central circle. Below the circle they are pointed downward and above they are pointed upward. There is an identical column shape with the same patterns at either end of the stage. At the top of the wall panels there is a horizontal line at the level of the Corinthian patterning at the top. Between this line and the line depicting the cornice level above, between the columns, is a pattern of draped garlands, within which are the shapes of masks or faces, three per wall section. Above this section are numerous horizontal lines placed closely together, in the middle of which is a wide horizontal band with a snakeskin pattern. Above the upper border of the thin horizontal lines is a row with three round portrait frames against the back wall, and two semicircle frames at the top of the curved sides of the stage. Within each of the rounded portrait frames on either side of the central portrait frame, there is an indistinct naked figure holding a banner. The central portrait shows a seated woman with dark hair, wearing a long, wide-skirted, strapless dress. On the same side of the theater as the stage, the wall portions that extend past the final columns on either end of the stage also have rounded portrait frames, with the figure inside the frame on the left indistinct, and the image inside the frame on the right side showing a naked figure holding a banner. The sections of wall facing the viewer on either side of the stage continue the decorative pattern shown above the stage. There is one draped banner on either side with a mask above in the center. Behind the crowd on the stage, the wall of the stage is curved in a band-shell type structure, with one arched doorway in the center, and one in the middle of each of the curved sides. The center arch is taller than the other two. On either side of the curved portion of the shell, closest to the hall, there is a seating box with draped curtains. Two people are visible in the seating box on the left side of the stage. Each of the three arches on stage is surmounted by a circle, within which is an image of a head. Depicted on either side of each of the circles is a reclining stone figure. The figures are naked, with wings. Each pair is holding the central circles with their arm closest to the circle, with their outer arms crossed in front of their bodies or resting at their sides. The central arched doorway is separated from the curved sides by two stylized columns on either side. The columns have Corinthian tops, and each has a circle shape in the center. Within each circle is a four-petal flower. On the columns, above and below the circles, there is a stylized heart-shaped pattern, with the point of each stylized heart directed away from the central circle. Below the circle they are pointed downward and above they are pointed upward. There is an identical column shape with the same patterns at either end of the stage.<br><br>At the top of the wall panels there is a horizontal line at the level of the Corinthian patterning at the top. Between this line and the line depicting the cornice level above, between the columns, is a pattern of draped garlands, within which are the shapes of masks or faces, three per wall section. Above this section are numerous horizontal lines placed closely together, in the middle of which is a wide horizontal band with a snakeskin pattern. Above the upper border of the thin horizontal lines is a row with three round portrait frames against the back wall, and two semicircle frames at the top of the curved sides of the stage. Within each of the rounded portrait frames on either side of the central portrait frame, there is an indistinct naked figure holding a banner. The central portrait shows a seated woman with dark hair, wearing a long, wide-skirted, strapless dress. On the same side of the theater as the stage, the wall portions that extend past the final columns on either end of the stage also have rounded portrait frames, with the figure inside the frame on the left indistinct, and the image inside the frame on the right side showing a naked figure holding a banner. The sections of wall facing the viewer on either side of the stage continue the decorative pattern shown above the stage. There is one draped banner on either side with a mask above in the center. On the floor of the theater there is a large crowd of men, divided into two sides to the left and the right of the staircase, creating a clear pathway down the center of the hall. Most of the men are seated facing each other, with some men standing at the edges of the crowd and at the back of the crowd. There is a band close to the stage on the right, wearing gray uniforms and tall, narrow hats with round decorations at the top front. The only instruments visible are a large drum and a horn. Standing at the back of the crowd, two with their backs to the viewer, partially obscuring the central path, are three men with black suits, black sashes, white gloves and round, black hats. The suits have long jackets, the hats each have one white feather plume and the sashes have rosettes and gold trim. The sashes cross their backs. One of these three men is facing the viewer and is holding his right hand up by his hip. The view of the room shows the faces of most of the men on the left, and the backs or sides of the heads of the men on the right. Most of the men on the floor of the hall are wearing red collars or sashes over black suits with white shirts. Some are wearing black collars or sashes with gold trim. There are three vertically rectangular banners held aloft by poles in the crowd on the floor of the hall, with a tasseled cord hanging from the top horizontal bars. The banner on the left shows an image of George Washington. There are two banners on the right side of the hall, one with an indistinct image and the other with Masonic symbols, including an eye in the midst of a cloud, an eagle with outstretched wings standing on top of a downward-pointing triangle, a key and a circle quadrant with a compasses on top of it. On either side of the theater are two balconies, one above the other. All four balconies are filled with both men and women. The balconies on the left side of the hall show the faces, and on the right show a side view of the attendees. The balconies are supported by thin, garland-wrapped poles. Hanging from the bottom of the lower balconies is a row of light globes. On the floor of the theater there is a large crowd of men, divided into two sides to the left and the right of the staircase, creating a clear pathway down the center of the hall. Most of the men are seated facing each other, with some men standing at the edges of the crowd and at the back of the crowd. There is a band close to the stage on the right, wearing gray uniforms and tall, narrow hats with round decorations at the top front. The only instruments visible are a large drum and a horn. Standing at the back of the crowd, two with their backs to the viewer, partially obscuring the central path, are three men with black suits, black sashes, white gloves and round, black hats. The suits have long jackets, the hats each have one white feather plume and the sashes have rosettes and gold trim. The sashes cross their backs. One of these three men is facing the viewer and is holding his right hand up by his hip.<br>The view of the room shows the faces of most of the men on the left, and the backs or sides of the heads of the men on the right. Most of the men on the floor of the hall are wearing red collars or sashes over black suits with white shirts. Some are wearing black collars or sashes with gold trim. There are three vertically rectangular banners held aloft by poles in the crowd on the floor of the hall, with a tasseled cord hanging from the top horizontal bars. The banner on the left shows an image of George Washington. There are two banners on the right side of the hall, one with an indistinct image and the other with Masonic symbols, including an eye in the midst of a cloud, an eagle with outstretched wings standing on top of a downward-pointing triangle, a key and a circle quadrant with a compasses on top of it.<br>On either side of the theater are two balconies, one above the other. All four balconies are filled with both men and women. The balconies on the left side of the hall show the faces, and on the right show a side view of the attendees. The balconies are supported by thin, garland-wrapped poles. Hanging from the bottom of the lower balconies is a row of light globes. Many of the faces of the men on stage and in the crowd in front are portrait images, and there is in the catalog record [for a second, framed example of this print] a mention of a key to the images. At the top of the lithograph is printed, in all capital lettering, "Property of Mariners Lodge No. 67." [Since this is not printed at the top of the other example of this lithograph that is part of the Livingston Library Collection, it is believed that there was a lithograph of the event given to each of the attendant Lodges.] Beneath the printing at the top of the lithograph, there is a border made of three thin lines that surround the entire print. The two lines on the outside are lighter in color than the line closest to the image. At each of the four corners, the three lines weave together in a stylized geometric pattern. Within the border lines, next to the bottom center of the print, the copyright information is printed in capital and small italic lettering. Outside of the border lines, under the corner on the left, is printed the artist's name and under the corner on the right is the printer's name. The artist and the printer information is printed in a block font, with capital and small lettering. At the very bottom center of the print, in the middle of the title information, there is a G in the center of a five-point star, with stylized foliage and flourishes on either side. The foliage shows oval leaves with small round flowers at the ends of long stems. The title is printed in a mixture of five different fonts, all of which are in capital and small lettering except for the first line, which is in all capital lettering. The lithograph is attached to a fabric backing. It had been folded in half at one point, and there is a water stain at the top part of the fold. There are numerous scratches across the surface. The approach of St. John's Grand Lodge "was heralded by a Flourish of Trumpets. Being duly announced and admitted, they were received with the Public Grand Honors. The whole scene, at this time, was truly magnificent and intensely exciting. Each tier of the immense Saloon was densely crowded by the youth and beauty of our city. The Stage, considerably enlarged beyond its ordinary dimensions, was occupied by the Grand officers; the officers of the Grand Lodges of Connecticut and New Jersey; the invited guests from our sister States, and other brothers of high rank in the Order. On one side of the Grand Master rested the Sacred Ark with the Cherubims (sic), and on the other side the Holy Bible, Square and Compasses, resting on a crimson cushion. The members of the subordinate Lodges, attended by their officers, were ranged along the floor of the Hall. "But the enthusiasm and deep heart-felt joy manifested by all the brethren present, far surpassed, in the estimation of the sincere lovers of our Order, the dazzling brilliancy and splendor of this sublime and never to be forgotten scene. "As soon as each Grand officer of St. John's Grand Lodge had taken the place reserved for him, at the right of the corresponding Grand officer of the Grand Lodge of the State of New York, and their subordinate bodies had assumed their positions on the floor of the Hall, the Grand Lodge of the State of New York gave them a Grand Salute. Archives, Chancellor Robert R Livingston Masonic Library of Grand Lodge, New York, NY;<br>Proceedings of a Special Grand Communication of the M..W.. Grand Lodge of the Most Ancient and Honorable Fraternity of Free and Accepted Masons of the State of New York, to Consummate the Union of the Brethren hitherto under the Jurisdiction of St. John's Grand, December 27th, A.D. 1850, A.L. 5850: Also, A Brief Narrative of the Origin, History, and Dissolution of St. John's Grand Lodge; and other Matters Interesting to the Craft, Bro. Narine, Printer, New York, 1851.